Imagine stepping into your forest at night and being utterly swarmed by flies, mosquitoes, beetles, and moths. Glad that's not the case? Thank a bat. 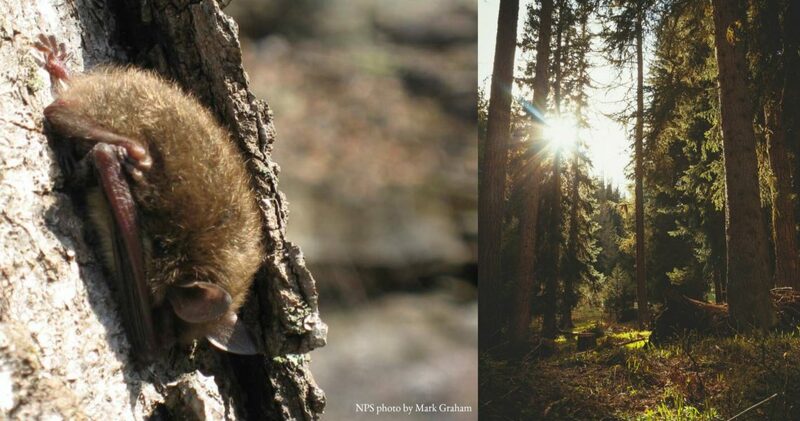 Bats flit through our Pacific Northwest forests every night, but it’s easy to forget they exist. After all, we almost never encounter them (except on October 31st, when they appear taped to our windows, carved into pumpkins, and ringing our doorbells begging for candy). And yet—if all bats disappeared overnight, we’d likely notice their absence very quickly as insect populations boomed and our evening walks became nightly games of “let’s see who can carry on a conversation while walking fast, swatting, scratching, and keeping our mouths shut“. You see, the bats we have in the Pacific Northwest guzzle insects. 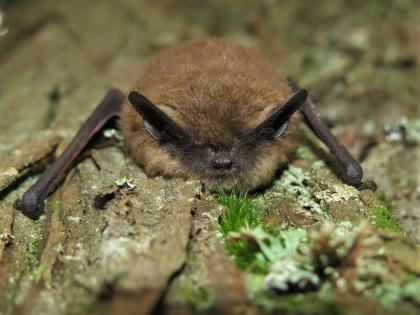 They practically vacuum them up; a single little brown myotis, a common resident in PNW forests, can consume 1,000 mosquito-sized insects in one hour! Bats help pollinate numerous types of fruit trees, and in other parts of the country, aid in the dispersal of seeds. Their guano is an excellent fertilizer (find it on the shelves of your local garden center). It’s likely you know some things about bats already. For example, that some of them echo-locate and that 3 species of bat feed on blood (none of which are here in the PNW). But do you consider them your forest friends? Do you ever give them more than a cursory thought? We think bats are worth digging into a little deeper. Read on to learn more about why bats are interesting, and how to help protect them. 7 reasons to be more interested in bats. Bats are wildly diverse. They are found nearly everywhere — on every part of the planet except in extreme deserts or in arctic conditions. There are over 1,300 species of bats, which range hugely in size. In fact, the world’s smallest mammal is the Kitti’s hog-nosed bat, which weighs less than a penny. In contrast, flying foxes can have wingspans up to 6 feet. Oregon and Washington have 15 species of bat. They are all insectivores. Bat are directly responsible for the margarita. Tequila comes from agave, which is almost solely pollinated by three species of fruit bats that feed on agave nectar. Unfortunately, the rise in commercial tequila production over the last few decades has led to agave production methods that reduce the food available for bats. Look for the “bat friendly” logo on tequila bottles the next time you shop. Bats have belly-buttons! They’re mammals, just like us. Adding to the list of ways in which bats are like us: bats typically give birth to one baby, or ‘pup’ at a time, and their wing structure has basically the same bone structure of a human arm and hand (give or take a bit of wing membrane). Bats are the only flying mammal in the world. And on that note, folks—let’s refrain from calling them flying rodents. Not that we object to rodents—it’s just not accurate, unless you speak German (for which the word for bat literally translates to English as “mouse with wings”). Bats are cute. We understand there may be differing opinions on this one. 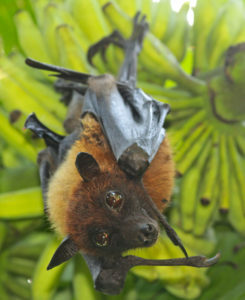 But if you like little dogs, fruit bats are only a hop, skip, and a jump away from those, aesthetically speaking. It’ll probably be a little more difficult for us to convince you that all insect-eating bats are cute. But we encourage you to give them a chance in your heart anyway. Below is a Pallid Bat, one of our native species. Bats are struggling. 40% of all U.S. bats are endangered or threatened. Between 8 and 9 of the PNW’s 15 bat species are at risk. In almost all areas, human alternation of habitat poses a significant threat to bats. Development or clear-cutting of forests destroys bat roosts and limits their ability to forage for insects. White-Nose Syndrome, a fungal disease spreading across North America is a recent, serious threat to bat populations. It has devastated east coast bat populations and has no known cure (though scientists are working hard to find one). In the last three years, a few cases of white-nose have been detected in Washington state. None have been found in Oregon. I understand that bats are important, and that they need help. What can I do? Building bat houses will provide more roost options for bats in your area. Put well-sealed black-painted bat houses in sunny locations at least 12 to 15 feet off the ground and ensure the entrance is free from obstructions for a 15 to 20 foot area. 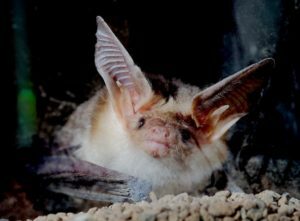 Bats Northwest, a bat conservation non-profit based in Seattle, has put together a helpful page on building bat houses. Find more information about bats of the Pacific Northwest on the Bats Northwest website, the Oregon Department of Fish and Wildlife page on bats, and the Washington Department of Fish and Wildlife page on bats.